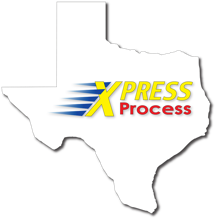 When you need a quick, reliable and thorough process serving company, let Xpress Process be your first choice. We serve subpoenas and other legal documents throughout Texas out of our office in San Antonio. Fill out our form or call (210) 332-8773 today for quality legal assistance services today. Our goal is to make a first attempt within 36-48 hours of receiving your documents for service. We will perform at least 4 attempts (6 for Harris County) before requesting and creating an Affidavit for Alternate Service under TRCP Rules 106 & 501. Once the signed Judge’s Order for Substitute Service is received, we will attach the Order and deliver the documents accordingly. - Citation, Summons, Precept, etc. - We are happy to print your documents to expedite your serve. Please send them in PDF format for best results. We don’t charge for the first 35 pages. For additional pages add $0.25 per page. -Notice to Appear, TRO, TPO, etc. - 1st attempt within 4hrs and daily attempts afterwards. - 1st attempt within 24hrs and daily attempts afterwards. 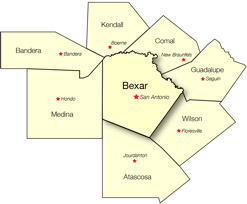 - For counties outside those surrounding Bexar County, we will outsource to other certified servers to help keep costs down. However, should we not find a quality certified server, we will personally travel to get these documents served. The fee for this service is $1 per mile, calculated one-way, in addition to the Basic Service Charge. -We are not a Private Investigative company and only locate addresses for service of documents. Our team is here to serve your needs. We strive to provide the highest quality servers in the business. We only utilize Texas Judicial Branch Certification Commission Certified Process Servers, to handle your papers within Texas, who have undergone Texas DPS & FBI criminal background checks. Each of our servers must also participate in on-going continuing education to maintain their Certification as outlined by the Judicial Branch Certification Commission. This should give you peace of mind knowing our servers are taking care of your sensitive documents while interacting with the citizens of Texas. For service of process outside of Texas we contract with process servers from other affiliated State Process Server Organizations & NAPPS. We can also assist you with international service through our partnership with other firms specializing in this field. The owner has been personally serving process for over 19 years. He is currently the Training Director for the Texas Process Servers Association and remains current with changes in the law affecting service of process. Since 2008, he has provided initial and recurring instruction to over 5,500 documented attendees under the Texas Judicial Branch Certification Commission Process Server Certification Program. © Copyright Xpress Process. All rights reserved.